MOUNTAIN VIEW, CA--(Marketwire - November 25, 2008) - Verismo Networks and NETGEAR® are collaborating on products that will enhance TV entertainment by giving consumers the ability to access and enjoy Internet video directly on the TV without a computer. The partnership leverages Verismo's strength in multimedia and Internet TV, along with NETGEAR's global leadership in home networking solutions including Wireless-N Routers and Adapters, ADSL and Cable Gateways, ReadyNAS™ Network Storage, Digital Entertainers, and Powerline Networking products. "Verismo has shown great innovation in changing the way Internet videos are viewed in the home and directly from the TV. This partnership will give consumers a best-of-breed solution for enjoying the experience of Internet TV with more choices and better access to content," said Vivek Pathela, Vice President & General Manager of Home/Consumer Product Development and Marketing at NETGEAR. Verismo's VuNow™ Internet TV platform gives consumers the broadest choice of online video content including movies, YouTube videos, live TV channels, and more. 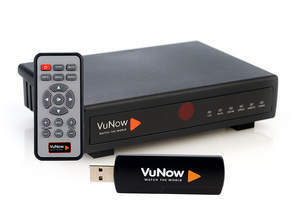 Unlike other solutions, VuNow lets users stream and watch Internet content right on their televisions with a click of the remote. "We're very pleased to work with NETGEAR; they are respected across the world for their leadership in digital entertainment and home networking. This collaboration is a reflection of our shared commitment in driving innovation to enhance the digital living room," said Prakash Bhalerao, CEO of Verismo Networks. Verismo's VuNow platform transforms the TV set into a powerful multi-media hub with an unbelievable level of choice and ease in accessing digital entertainment. You've never seen your television like this before. The privately held company is based in Mountain View, California with offices in Bangalore, India. For more information, please visit www.verismonetworks.com. NETGEAR® (NASDAQ: NTGR) designs innovative, branded technology solutions that address the specific networking, storage, and security needs of small- to medium-sized businesses and home users. The company offers an end-to-end networking product portfolio to enable users to share Internet access, peripherals, files, multimedia content, and applications among multiple computers and other Internet-enabled devices. Products are built on a variety of proven technologies such as wireless, Ethernet and powerline, with a focus on reliability and ease-of-use. NETGEAR products are sold in over 29,000 retail locations around the globe, and via more than 41,000 value-added resellers. The company's headquarters are in San Jose, Calif., with additional offices in 19 countries. NETGEAR is an ENERGY STAR® partner. More information is available by visiting www.netgear.com or calling (408) 907-8000.